Update 08/28/2016: It seems the bear / correction ended in February 2016. Here is a good technical analysis by Blair Jensen at Investing.com. Update 08/24/2015: Don’t be greedy. Trade to your plan. Market panicked the following Monday, with $VIX shot above 50. Theoretically, I could have sold SH today and buy VTI… Only theoretically, it will be too predictive and nerve wracking. Don’t be greedy, just watch the show. Update 08/22/2015: My judgement was right. All indices broke down heavily below 200MA. I sold my SH position according to my preset trading target $SPY 1990. Tempted to change but successfully resisted. Potential improvement: perhaps I bought my SH position at a $VIX high moment. Maybe safer to buy at low $VIX. No regret for VTI selling. Head and shoulders pattern forming in major indices. 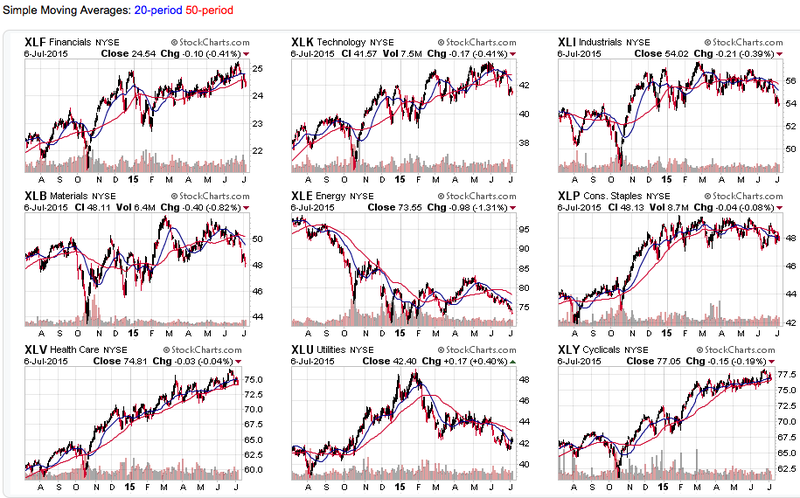 Many sectors dove below 200MA, with only Financial, Healthcare and Consumer Cyclicals are making new high. Not even technology. These news signals a storm coming. Greece debt problem is just the beginning. More trouble is coming in Europe. In US, interest rate hike is coming. While in long term it is a good sign, in short term, market is going to take a hit. Chinese market is not a good sign either. This bull market is 6+ years old since 03.2009 or 3.7 years old if you start from 10.2011. Average bull market is 3.7+/-1.5 years. Majors indices are way over-extended. SP500 has tripled from 2009 low. SP500 and DOW30 are ~40% above 2007 high. NASDAQ just reached its 2000 tech bubble high of 51xx, a key psychological level. News: Greece debt problem is just the beginning. More trouble is coming in Europe. In US, interest rate hike is coming. While in long term it is a good sign, in short term, market is going to take a hit. Chinese market is not a good sign either. If I am wrong, please have a big laugh at me.